Once data on population size, reproduction, survival rates and dolphin movement patterns have been gathered you can construct a population model to find out if the population is growing or declining. If the reproductive rate is higher than the natural mortality rate plus human-caused mortality, then the population will grow. 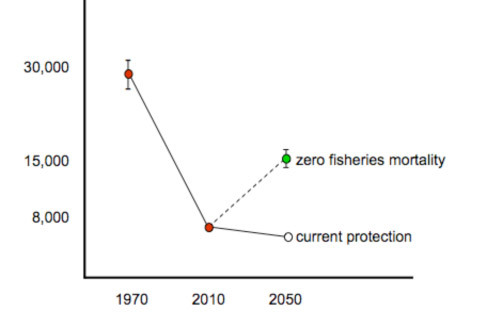 If natural mortality is very high, or a large number of dolphins are killed in fishing nets and/or through other human impacts, then the population is likely to decline. The Trust has supported a range of risk analysis work on Hector’s dolphins. This has shown that, while current protection is a major improvement over past management, we are still a long way off effective protection for Hector’s dolphin. For example, the population has declined from about 30,000 Hector’s dolphins in 1970 to fewer than 8,000 now. The rate of decline has dropped markedly, but any significant population recovery requires much better protection.